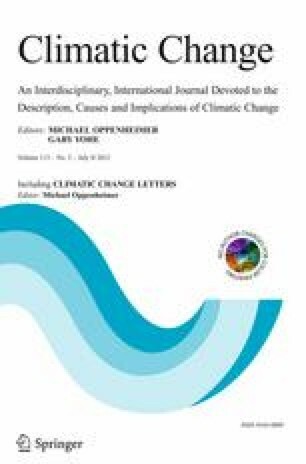 The Intergovernmental Panel on Climate Change (IPCC) publishes periodical assessment reports informing policymakers and the public on issues relevant to the understanding of human induced climate change. The IPCC uses a set of 7 verbal descriptions of uncertainty, such as unlikely and very likely to convey the underlying imprecision of its forecasts and conclusions. We report results of an experiment comparing the effectiveness of communication using these words and their numerical counterparts. We show that the public consistently misinterprets the probabilistic statements in the IPCC report in a regressive fashion, and that there are large individual differences in the interpretation of these statements, which are associated with the respondents’ ideology and their views and beliefs about climate change issues. Most importantly our results suggest that using a dual (verbal—numerical) scale would be superior to the current mode of communication as it (a) increases the level of differentiation between the various terms, (b) increases the consistency of interpretation of these terms, and (c) increases the level of consistency with the IPCC guidelines. Most importantly, these positive effects are independent of the respondents’ ideological and environmental views. The online version of this article (doi: 10.1007/s10584-011-0330-3) contains supplementary material, which is available to authorized users. This work was supported by the National Science Foundation under Grant No. 0345925, and the data were collected by Time-sharing Experiments for the Social Sciences, NSF Grant 0818839 (Jeremy Freese and Penny Visser, Principal Investigators). The third author was supported by the National Geospatial-Intelligence Agency (under Grant No. HM1582-09-1-0020). The opinions, findings and conclusions or recommendations expressed in this paper are those of the authors and do not necessarily reflect the views of the funding entity. Many thanks to Profs. Klaus Keller and Thomas Wallsten and three reviewers for useful comments and suggestions on an earlier version.